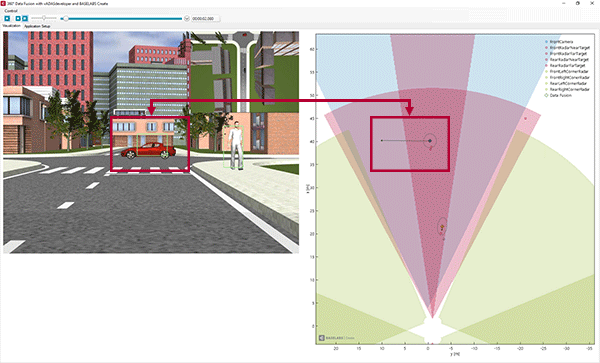 Cross traffic support and extended object tracking increase the performance of the environment perception for urban and highway scenarios. With RTMaps, we broaden the support for relevant middleware products. We notice an increasing need for prototyping of automated driving functions in the community. Our data fusion prototyping tool BASELABS Create allows fast development and improvement of environment perception systems. We aim at enabling faster results for each developer of environment perception systems while reducing the effort for inhouse software development and maintenance at the same time. BASELABS Create now gives developers more support for the implementation of driving functions like highway pilots and NCAP-2018-relevant applications like AEB. 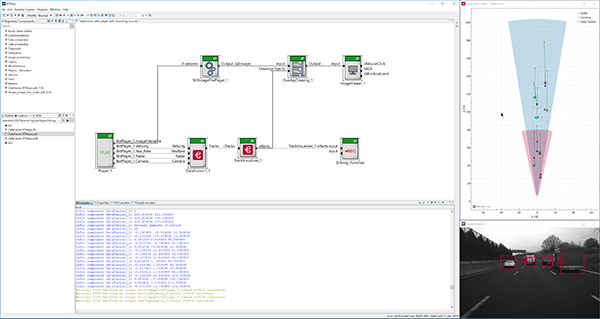 From a workflow integration perspective, we want to highlight that data fusion applications can also be developed in a combined workflow of RTMaps as a middleware and BASELABS Create. Overall, BASELABS Create supports all relevant middleware software products and can also be integrated with in-house frameworks. You look for more than prototypes and your target is series production? Perfect - let's talk about a custom development project according to your needs. Enjoy developing! We look forward to supporting your endeavours in prototyping and series projects. Please contact us for your requirements and to share your experiences with our products. For automated vehicles that operate in urban areas and intersections, relevant objects may be those which cross the path of the vehicle. Detecting cross traffic participants properly is a challenge for environment perception systems, because e.g. front facing radar sensors cannot distinguish between a stationary object and a transversely driving vehicle within a single measurement cycle. Data fusion and tracking algorithms can overcome this limitation, however, this requires additional resources and enhanced modelling capabilities. BASELABS Create includes several sensor models that support the configuration and handling of cross traffic participants, e.g. to implement automated driving functions that fulfil Euro NCAP 2018 requirements. Upcoming functions that automate driving on highways rely on the proper recognition and tracking of vehicles in adjacent lanes, e.g. while driving by. Sensors like radars typically perceive multiple reflections of close-by vehicles which is often denoted as extended object tracking. To reliably track these vehicles, data fusion systems need to be aware of this situation. BASELABS Create supports the configuration and handling of extended objects for radar sensors with built-in models, other sensors can be added by user defined models. For the integration and execution of a data fusion algorithm generated by the data fusion designer of BASELABS Create, a middleware for sensor data acquisition, recording and replay is typically used. A well-established middleware is RTMaps by Intempora. BASELABS Create supports RTMaps by its interfaces for the C/C++ language. Through these interfaces, the generated data fusion systems execute on Windows and Linux and can target x86, ARM and PowerPC architectures. LOOKING FOR A NEW POSITION AT GREAT PLACE TO WORK? Thanks to the success of our products the BASELABS-team grew from four members founding the company in 2012 to now 39 employees and 6 students. Proudly, we can say that this is not the end of the story. At the moment we are searching for various software developers, a CIO, an HR manager and are offering different student jobs. We offer these positions at our headquarters in the city of Chemnitz. The city has just been rated among the top 25% of liveable areas in Germany. 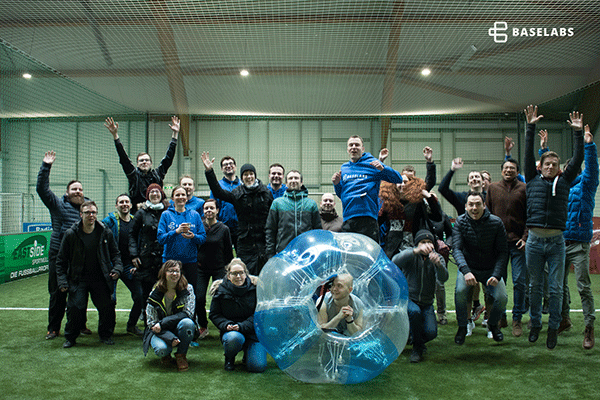 Check out our job offers and learn more about working at BASELABS which is more than challenging tasks, but discussing, developing and laughing with diverse creative brains. Another topic that is particularly important to us is the support of young talents. Since 2015, BASELABS is funding a talented student in his studies within the “Deutschlandstipendium”, a scholarship program, every year. Beside this, in 2017 BASELABS sponsored 4.650 Euro also to different other associations: Fortis Saxonia and T.U.C. Racing team (student associations at the University of Chemnitz who participate in the Shell Eco Marathon or the Formula Student, respectively), RoboSAX (student robot contest) and Informatik 2017 (annual informatics conference). Those sponsoring activities focus on topics that are of high relevance for the automotive industry. The protection of your privacy and your personal data is very important to us. With this newsletter, we want to keep you updated on relevant developments, company or product news and events. Your contact data and email will neither be used for other purposes nor forwarded to any third parties. You can disagree with this anytime with an email or by unsubscribing to the newsletter below. Please find further information in our privacy policies. Diese Website verwendet Cookies, um Ihr Benutzererlebnis zu verbessern. Mit Ihrem Besuch auf www.baselabs.de stimmen Sie der Verwendung von Cookies zu.